Ok, so I wasn’t planning on more skating updates, but there have been some interesting recent developments. Somehow with skating “interesting” often develops into “expensive” but it has been a while since I have updated equipment, so I suppose that was to be expected? In any case, you can read about Part I, Part II, Part III, Part IV, and Part V wherein I got new plates and played around with the cushion selection and click action adjustment. Since then, there has been some new developments, which will be leading to another set of new skates. Development #1: After skating on my new figure plates, I had decided that I really liked them for loops, but that they are slightly a bit too reactive for figures. While people have commented that I look solid, I do not feel solid when I am skating on them. I have also noticed that when adjusting from loop action to figure action that it takes a long time for the cushions to settle into proper position, and that I have to re-adjust my settings several times after I adjust initially. I decided that I would eventually like to get another set of plates (still Roll Line, but a different model) for a set of new boots that I have had since March (I won a gift certificate, but it had an expiration date, so we ordered the boots earlier than I needed them). So that was the start of thinking about getting even more new skating equipment. Development #2: Getting new equipment means there is old equipment lying about. Usually, nobody wants my old skate parts because they are either too worn or too big. However, since going to the Harlick boot, I had been using smaller sized plates, which are apparently one of the most commonly used sizes. So no sooner had my old skates come apart than I had the skate shop lady asking for them, with one or two potential buyers in mind. Sweet. Money that can I can use to get my third set of skates all set up. Development #4: This past weekend I was discussing my new skates with another skater who has done a lot of skate maintenance for his family. I was telling him how the right and left feet of my figure skates never quite felt the same and that I thought I needed to adjust the pivot pins, but that despite my best efforts the things wouldn’t budge. Up to this point I had only been changing the cushions and adjusting the click action nut. Let’s just say it took quite a bit of effort to get the pivots to move. According to skate friend, the pivots were not sitting far enough into the cups. This would cause the skate to not curve as fast when I applied pressure to the side of the skate, and then to suddenly curve once they pivot hit the cup. This probably accounted for the problems I had been having with my loops – I could get the curve to start, but once I had gotten past the deepest part of the edge, and released the pressure a bit the skate stopped short. We made the adjustment on both the dance and figure (well, soon to be loop) skates. All I can say is WOW. What a difference. The dance skates react crazy fast now. Almost too fast. It is like having an entirely new skate to get used to. I also feel like it has helped with my pushes, since the force is going directly into the floor, and not having some of it absorbed by the space between the pivot pin and the skate. And the loop skates. Sigh. Amazing. They feel so much better now. It was like things suddenly clicked into place and made sense. So, now I am loving my new skates even more, and I am going to have another new setup to get used to. My coach seems happy about the prospect of having dedicated skates since I won’t have to adjust them constantly. He was also quite pleased with my progress since getting the new dance skates (he hasn’t seen me since the adjustment on the loop skates yet). 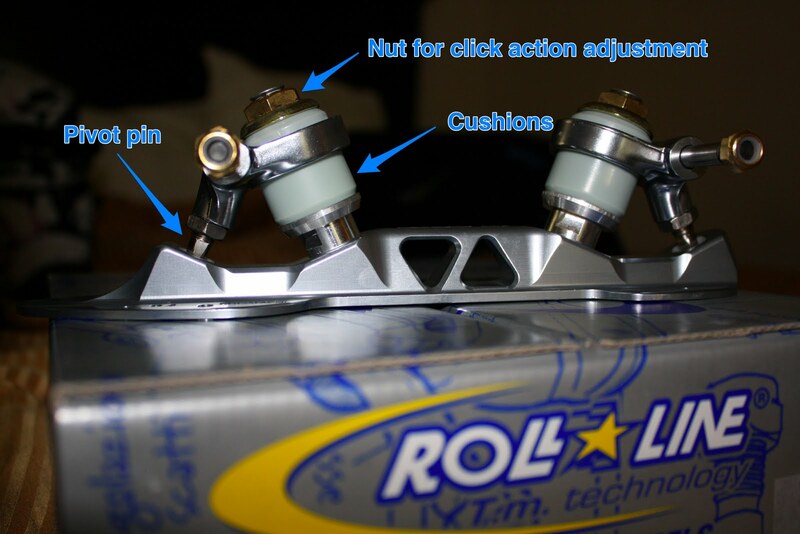 Having dedicated skates should also prevent excessive wear on the figure skates, since I won’t be applying the extreme force that is needed in skating loops. This will hopefully prolong the lifetime of the skates and long term be more cost effective than buying new boots every few years. I am super excited by the new equipment and I can’t wait to see how it performs over the coming season.